Sydney International 2019 will be held at Sydney Olympic Park Tennis Centre from 6 to 12 January 2019. The tournament is part of the Emirates Australian Open Series. Australia’s top ranked tennis stars, eight Grand Slam champions, eight of the world’s top 10 female players, and the cream of the ATP Tour’s Next Gen are destined for Sydney International 2019, in one of the most exciting line-ups assembled in the tournament’s 124-year history. World No.1 and reigning French Open champion Simona Halep will headline the women’s field, along with defending Sydney champion and Wimbledon champion Angelique Kerber, and reigning US Open champion Naomi Osaka. They will be joined by 2017 US Open champion Sloane Stephens, two-time Wimbledon champion Petra Kvitova, fellow top 10 players Karolina Pliskova, Kiki Bertens, and Daria Kasatkina, Australian No.1 and Sydney 2018 runner-up Ash Barty (Qld), 2011 US Open champion Sam Stosur (Qld), 2017 French Open champion Jelena Ostapenko and 2016 French Open and 2017 Wimbledon champion Garbine Muguruza. Reigning champion Daniil Medvedev is set to return to Sydney Olympic Park to defend his title against tournament top seed Kyle Edmund and 2018 Next Gen ATP Finals champion Stefanos Tsitsipas. They will be joined by Australian No.1 and Sydney International 2018 runner-up Alex de Minaur (NSW), fellow rising star Frances Tiafoe, and familiar faces including Australian Open 2008 runner-up Jo-Wilfried Tsonga, and Australian favourites Matt Ebden and John Millman. Barty and De Minaur were at the Hyatt Regency for the Sydney International full field announcement and both were excited about returning to the scene of their first tour-level finals on home soil. “I had a great 2018 Sydney International and can’t wait to go back in January,” Barty said. “Reaching the final gave me a lot of confidence leading into the Australian Open and was an important part of my summer preparation. The 2018 ATP Newcomer of the Year, De Minaur was also looking forward to returning to his home tournament, 12 months after contesting his maiden ATP Tour final. 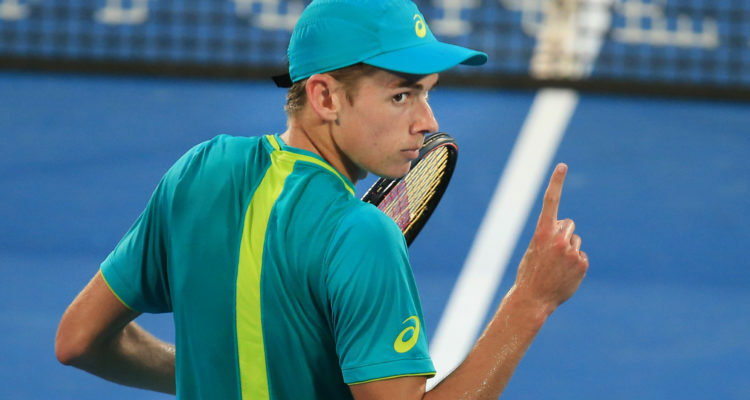 “I am really looking forward to playing again in front of my home crowd,” De Minaur said. Sydney International Tournament Director Lawrence Robertson said Sydney sports fans can look forward to some spectacular matches in January. “It’s hard to believe that we could surpass the quality of the field the Sydney International attracted in 2018,” Robertson said. “With eight Grand Slam champions and eight of the world’s top 10 in the women’s draw, and the best up-and-coming talent on the ATP Tour confirmed to play, Sydney International 2019 is certainly going to be one of the most exciting in the event’s 124 year history. This entry was posted in ATP Tour, ATP Tour News, WTA Tour News and tagged Alex de Minaur, ATP World Tour, Sydney International, WTA.